Émile Édouard Charles Antoine Zola (/ˈzoʊlə/; French: [e.mil zo.la]; 2 April 1840 – 29 September 1902) was a French novelist, playwright, journalist, the best-known practitioner of the literary school of naturalism, and an important contributor to the development of theatrical naturalism. He was a major figure in the political liberalization of France and in the exoneration of the falsely accused and convicted army officer Alfred Dreyfus, which is encapsulated in the renowned newspaper headline J'Accuse…! Zola was nominated for the first and second Nobel Prize in Literature in 1901 and 1902. Zola was born in Paris in 1840. His father, François Zola (originally Francesco Zola), was an Italian engineer, born in Venice in 1795, who engineered the Zola Dam in Aix-en-Provence, and his mother, Émilie Aubert, was French. The family moved to Aix-en-Provence in the southeast when Émile was three years old. Four years later, in 1847, his father died, leaving his mother on a meager pension. In 1858, the Zolas moved to Paris, where Émile's childhood friend Paul Cézanne soon joined him. Zola started to write in the romantic style. His widowed mother had planned a law career for Émile, but he failed his Baccalauréat examination. Before his breakthrough as a writer, Zola worked as a clerk in a shipping firm and then in the sales department for a publisher (Hachette). He also wrote literary and art reviews for newspapers. As a political journalist, Zola did not hide his dislike of Napoleon III, who had successfully run for the office of president under the constitution of the French Second Republic, only to misuse this position as a springboard for the coup d'état that made him emperor. In 1862, Zola was naturalized as a French citizen. In 1865, he met Éléonore-Alexandrine Meley, who called herself Gabrielle, a seamstress, who became his mistress. They married on the 31 May 1870. She stayed with him all his life and was instrumental in promoting his work. The marriage remained childless. Alexandrine Zola had a child before she met Zola that she had given up, because she was unable to take care of it. When she confessed this to Zola after their marriage, they went looking for the girl, but she had died a short time after birth. In 1888, he took up photography and obtained a near professional level of expertise. Also in 1888, Alexandrine hired Jeanne Rozerot, a seamstress who was to live with them in their home in Médan. Zola fell in love with Jeanne and fathered two children with her: Denise in 1889 and Jacques in 1891. After Jeanne left Médan for Paris, Zola continued to support and visit her and their children. In November 1891 Alexandrine discovered the affair, which brought the marriage to the brink of divorce. The discord was partially healed, which allowed Zola to take an increasingly active role in the lives of the children. After Zola's death, the children were given his name as their lawful surname. 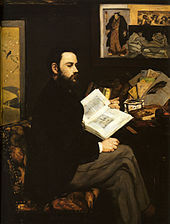 During his early years, Zola wrote numerous short stories and essays, four plays, and three novels. Among his early books was Contes à Ninon, published in 1864. With the publication of his sordid autobiographical novel La Confession de Claude (1865) attracting police attention, Hachette fired Zola. His novel Les Mystères de Marseille appeared as a serial in 1867. After his first major novel, Thérèse Raquin (1867), Zola started the series called Les Rougon-Macquart, about a family under the Second Empire. 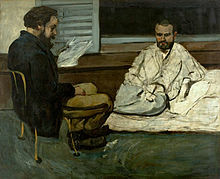 In Paris, Zola maintained his friendship with Cézanne, who painted a portrait of him with another friend from Aix-en-Provence, writer Paul Alexis, entitled Paul Alexis Reading to Zola. More than half of Zola's novels were part of a set of 20 collectively known as Les Rougon-Macquart. Unlike Balzac, who in the midst of his literary career resynthesized his work into La Comédie Humaine, Zola from the start, at the age of 28, had thought of the complete layout of the series. Set in France's Second Empire, the series traces the "environmental" influences of violence, alcohol, and prostitution which became more prevalent during the second wave of the Industrial Revolution. The series examines two branches of a family—the respectable (that is, legitimate) Rougons and the disreputable (illegitimate) Macquarts—for five generations. As he described his plans for the series, "I want to portray, at the outset of a century of liberty and truth, a family that cannot restrain itself in its rush to possess all the good things that progress is making available and is derailed by its own momentum, the fatal convulsions that accompany the birth of a new world." Although Zola and Cézanne were friends from childhood, they experienced a falling out later in life over Zola's fictionalized depiction of Cézanne and the Bohemian life of painters in Zola's novel L'Œuvre (The Masterpiece, 1886). From 1877, with the publication of l'Assommoir, Émile Zola became wealthy; he was better paid than Victor Hugo, for example. Because l'Assommoir was such a success, Zola was able to renegotiate his contract with his publisher Georges Charpentier to receive more than 14 percent royalties and the exclusive rights to serial publication in the press. He became a figurehead among the literary bourgeoisie and organized cultural dinners with Guy de Maupassant, Joris-Karl Huysmans, and other writers at his luxurious villa (worth 300,000 francs) in Médan, near Paris, after 1880. Germinal in 1885, then the three "cities"—Lourdes (1894), Rome (1896), and Paris (1897), established Zola as a successful author. The self-proclaimed leader of French naturalism, Zola's works inspired operas such as those of Gustave Charpentier, notably Louise in the 1890s. His works, inspired by the concepts of heredity (Claude Bernard), social Manicheanism, and idealistic socialism, resonate with those of Nadar, Manet, and subsequently Flaubert. He is considered to be a significant influence on those writers that are credited with the creation of the so-called new journalism; Wolfe, Capote, Thompson, Mailer, Didion, Talese and others. Tom Wolfe wrote that his goal in writing fiction was to document contemporary society in the tradition of John Steinbeck, Charles Dickens, and Émile Zola. Captain Alfred Dreyfus was a French-Jewish artillery officer in the French army. In September 1894, French intelligence found information about someone giving the German Embassy military secrets. Anti-semitism caused senior officers to suspect Dreyfus, though there was no direct evidence of any wrongdoing. Dreyfus was court-martialed, convicted of treason, and sent to Devil's Island in French Guiana. Lt. Col. Georges Picquart came across evidence that implicated another officer, Ferdinand Walsin Esterhazy, and informed his superiors. Rather than move to clear Dreyfus, the decision was made to protect Esterhazy and ensure the original verdict was not overturned. Major Hubert-Joseph Henry forged documents that made it seem as if Dreyfus were guilty and then had Picquart assigned to duty in Africa. Before leaving, Picquart told some of Dreyfus' supporters what he knew. Soon Senator August Scheurer-Kestner took up the case, announced in the Senate that Dreyfus was innocent, and accused Esterhazy. The government refused to allow new evidence, and Esterhazy was tried and acquitted. Picquart was then sentenced to 60 days in prison. Zola risked his career and more on 13 January 1898, when his J'Accuse…! was published on the front page of the Paris daily L'Aurore. The newspaper was run by Ernest Vaughan and Georges Clemenceau, who decided that the controversial story would be in the form of an open letter to the President, Félix Faure. Zola's J'Accuse...! accused the highest levels of the French Army of obstruction of justice and antisemitism by having wrongfully convicted Alfred Dreyfus to life imprisonment on Devil's Island. 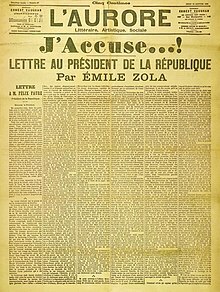 Zola's intention was that he be prosecuted for libel so that the new evidence in support of Dreyfus would be made public. The case, known as the Dreyfus affair, divided France deeply between the reactionary army and Catholic church, on one hand, and the more liberal commercial society, on the other. The ramifications continued for many years; on the 100th anniversary of Zola's article, France's Roman Catholic daily paper, La Croix, apologized for its antisemitic editorials during the Dreyfus affair. As Zola was a leading French thinker and public figure, his letter formed a major turning-point in the affair. Zola was brought to trial for criminal libel on 7 February 1898, and was convicted on 23 February and removed from the Legion of Honor. Rather than go to jail, Zola fled to England. Without even having had the time to pack a few clothes, he arrived at Victoria Station on 19 July. After his brief and unhappy residence in London, living at Upper Norwood from October 1898 to June 1899, he was allowed to return to France in time to see the government fall. The government offered Dreyfus a choice between a pardon (rather than exoneration), which would allow him to go free (provided that he admit to being guilty), or facing a re-trial in which he was sure to be convicted again. Although he was clearly not guilty, he chose to accept the pardon. Zola said of the affair, "The truth is on the march, and nothing shall stop it." In 1906, Dreyfus was completely exonerated by the Supreme Court. Zola's 1898 article is widely marked in France as the most prominent manifestation of the new power of the intellectuals (writers, artists, academicians) in shaping public opinion, the media and the state. Gravestone of Émile Zola at cimetière Montmartre; his remains are now interred in the Panthéon. Zola died on 29 September 1902 of carbon monoxide poisoning caused by an improperly ventilated chimney. His funeral on 5 October was attended by thousands. Alfred Dreyfus initially had promised not to attend the funeral but was given permission by Mme Zola and attended. His enemies were blamed for his death because of previous attempts on his life, but nothing could be proved at the time. Expressions of sympathy arrived from everywhere in France; for a week the vestibule of his house was crowded with notable writers, scientists, artists, and politicians who came to inscribe their names in the registers. On the other hand, Zola's enemies used the opportunity to celebrate in malicious glee. Writing in L'Intransigeant, Henri Rochefort claimed Zola had committed suicide, having discovered Dreyfus to be guilty. Zola was initially buried in the Cimetière de Montmartre in Paris, but on 4 June 1908, just five years and nine months after his death, his remains were relocated to the Panthéon, where he shares a crypt with Victor Hugo and Alexandre Dumas. The ceremony was disrupted by an assassination attempt by Louis-Anthelme Grégori, a disgruntled journalist and admirer of Edouard Drumont, on Alfred Dreyfus, who was wounded in the arm by the gunshot. Grégori was acquitted by the Parisian court which accepted his defense that he had not meant to kill Dreyfus, meaning merely to graze him. In 1953, an investigation ("Zola a-t-il été assassiné?") published by the journalist Jean Borel in the newspaper Libération raises the idea that Zola's death might have been a murder rather than an accident. It is based on the revelation of the Norman pharmacist Pierre Hacquin, who was told by the chimney sweeper Henri Buronfosse that the latter intentionally blocked the chimney of Zola's apartment in Paris ("Hacquin, je vais vous dire comment Zola est mort. [...] Zola a été asphyxié volontairement. C'est nous qui avons bouché la cheminée de son appartement."). Zola's 20 Rougon-Macquart novels are a panoramic account of the Second French Empire. They are the story of a family principally between the years 1851 and 1871. These 20 novels contain over 300 major characters, who descend from the two family lines of the Rougons and Macquarts and who are related. In Zola's words, which are the subtitle of the Rougon-Macquart series, they are "L'Histoire naturelle et sociale d'une famille sous le Second Empire"("The natural and social history of a family under the Second Empire"). Most of the Rougon-Macquart novels were written during the French Third Republic. To an extent, attitudes and value judgments may have been superimposed on that picture with the wisdom of hindsight. The débâcle in which the reign of Napoleon III of France culminated may have imparted a note of decadence to certain of the novels about France in the years before that disastrous defeat. Nowhere is the doom laden image of the Second Empire so clearly seen as in Nana, which culminates in echoes of the Franco-Prussian War (and hence by implication of the French defeat).Even in novels dealing with earlier periods of Napoleon III's reign the picture of the Second Empire is sometimes overlaid with the imagery of catastrophe. In the Rougon-Macquart novels, provincial life can seem to be overshadowed by Zola's preoccupation with the capital..However, the following novels (see the individual titles in the Livre de poche series) scarcely touch on life in Paris: La Terre (peasant life in Beauce), Le Rêve (an unnamed cathedral city), Germinal (collieries in the north east of France), La Joie de vivre (the Atlantic coast), and the four novels set in and around Plassans (modelled on his childhood home, Aix-en-Provence), (La Fortune des Rougon, La Conquête de Plassans, La Faute de l'Abbé Mouret and Le Docteur Pascal). La Débâcle, the military novel is set for the most part in country districts of eastern France; its dénouement takes place in the capital during the civil war leading to the suppression of the Paris Commune. Though Paris has its role in La Bête humaine the most striking incidents (notably the train-crash) take place elsewhere. Even the Paris-centred novels tend to set some scenes outside, if not very far from, the capital. In the political novel Son Excellence Eugene Rougon, the eponymous minister's interventions on behalf of his soi-disant friends, have their consequences elsewhere, and the reader is witness to some of them. Even Nana, that most Parisian of Zola's characters, makes a brief and typically disastrous trip to the country. Perhaps Une Page d'Amour, set in Passy, has something to tell us about Zola's attitude to Paris: Hélène, the central character has fled to the suburbs, but from her window the city dominates the view, beautiful but somehow baleful. In Le Roman expérimental and Les Romanciers naturalistes, Zola expounded the purposes of the 'naturalist' novel. The experimental novel was to serve as a vehicle for scientific experiment, analogous to the experiments conducted by Claude Bernard and expounded by him in Introduction à la médecine expérimentale. Claude Bernard's experiments were in the field of clinical physiology, those of the Naturalist writers (Zola being their leader) would be in the realm of psychology influenced by the natural environment. Balzac, Zola claimed, had already investigated the psychology of lechery in an experimental manner, in the figure of Hector Hulot in La Cousine Bette. Essential to Zola's concept of the experimental novel was dispassionate observation of the world, with all that it involved by way of meticulous documentation. To him, each novel should be based upon a dossier.With this aim, he visited the colliery of Anzin in northern France, in February 1884 when a strike was on; he visited La Beauce (for La Terre), Sedan, Ardennes (for La Débâcle) and travelled on the railway line between Paris and Le Havre (when researching La Bête humaine). Zola strongly claimed that Naturalist literature is an experimental analysis of human psychology. Considering this claim, many critics, such as György Lukács, find Zola strangely poor at creating lifelike and memorable characters in the manner of Honoré de Balzac or Charles Dickens, despite his ability to evoke powerful crowd scenes. It was important to Zola that no character should appear larger than life; but the criticism that his characters are "cardboard" is substantially more damaging. Zola, by refusing to make any of his characters larger than life (if that is what he has indeed done), did not inhibit himself from also achieving verisimilitude. Although Zola found it scientifically and artistically unjustifiable to create larger-than-life characters, his work presents some larger-than-life symbols which, like the mine Le Voreux in Germinal, take on the nature of a surrogate human life. The mine, the still in L'Assommoir and the locomotive La Lison in La Bête humaine impress the reader with the vivid reality of human beings. The great natural processes of seedtime and harvest, death and renewal in La Terre are instinct with a vitality which is not human but is the elemental energy of life. Human life is raised to the level of the mythical as the hammerblows of Titans are seemingly heard underground at Le Voreux or in La Faute de l'Abbé Mouret, the walled park of Le Paradou encloses a re-enactment – and restatement – of the Book of Genesis. In Zola there is the theorist and the writer, the poet, the scientist and the optimist – features that are basically joined together in his own confession of positivism; later in his life, when he saw his own position turning into an anachronism, he would still style himself with irony and sadness over the lost cause as "an old and rugged Positivist". The poet is the artist in words whose writing, as in the racecourse scene in Nana or in the descriptions of the laundry in L'Assommoir or in many passages of La Faute de l'Abbé Mouret, Le Ventre de Paris and La Curée, vies with the colourful impressionistic techniques of Claude Monet and Pierre-Auguste Renoir. The scientist is a believer in some measure of scientific determinism – not that this, despite his own words "devoid of free will" ("dépourvus de libre arbitre"), need always amount to a philosophical denial of free will. The creator of "la littérature putride", a term of abuse invented by an early critic of Thérèse Raquin (a novel which predates Les Rougon-Macquart series), emphasizes the squalid aspects of the human environment and upon the seamy side of human nature. The optimist is that other face of the scientific experimenter, the man with an unshakable belief in human progress. Zola bases his optimism on innéité and on the supposed capacity of the human race to make progress in a moral sense. Innéité is defined by Zola as that process in which "se confondent les caractères physiques et moraux des parents, sans que rien d'eux semble s'y retrouver"; it is the term used in biology to describe the process whereby the moral and temperamental dispositions of some individuals are unaffected by the hereditary transmission of genetic characteristics. Jean Macquart and Pascal Rougon are two instances of individuals liberated from the blemishes of their ancestors by the operation of the process of innéité. The Life of Emile Zola (1937) is a well received film biography, starring Paul Muni, that devotes significant footage to detailing Zola's involvement in exonerating Dreyfus. The film won the Academy Award for Best Picture. Cézanne et Moi (2016) is a French film, directed by Danièle Thompson, that explores the friendship between Zola and the Post-Impressionist painter Paul Cézanne. ^ "Zola". Random House Webster's Unabridged Dictionary. 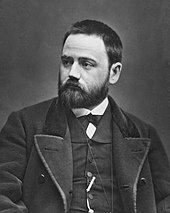 ^ "Emile Zola Biography (Writer)". infoplease. Retrieved 15 July 2011. ^ "Nomination Database - Literature - 1901". Nobelprize.org. Retrieved 7 February 2014. ^ "Nomination Database - Literature - 1902". Nobelprize.org. Retrieved 7 February 2014. ^ Sacquin, Michèle; Cabannes, Viviane (2002). Zola et autour d'une oeuvre : Au bonheur des dames. Bibliothèque nationale de France. ISBN 9782717722161. ^ Brown, Frederick. Zola: A Life. Farrar Straus Giroux. p. 195. ISBN 0374297428. ^ Brown, Frederick. Zola: A Life. Farrar Straus Giroux. pp. 614, 615. ISBN 0374297428. ^ Brown, Frederick. Zola: A Life. Farrar Straus Giroux. pp. 646–648. ISBN 0374297428. ^ Brown, Frederick. Zola: A Life. Farrar Straus Giroux. p. 802. ISBN 0374297428. ^ Martyn, Lyons (2011). Books : a living history. Los Angeles: J. Paul Getty Museum. p. 143. ISBN 9781606060834. OCLC 707023033. ^ "Literary gossip". The Week : a Canadian journal of politics, literature, science and arts. 1 (4): 61. 27 December 1883. Retrieved 23 April 2013. ^ "Correspondence Between Emile Zola and Imprisoned Alfred Dreyfus". Shapell Manuscript Foundation. ^ "World News Briefs; French Paper Apologizes For Slurs on Dreyfus". The New York Times. Reuters. 13 January 1998. Retrieved 25 March 2018. ^ Wikisource, I Accuse....! (English) URL: http://en.wikisource.org/wiki/J'accuse...! ^ Bridger, David; Wolk, Samuel (1 January 1976). The New Jewish Encyclopedia. Behrman House, Inc. p. 111. ISBN 978-0874411201. ^ "The Strange Death of Emile Zola". History Today Volume 52. 9 September 2002. Retrieved 21 February 2017. ^ "From the archives The tragic death of M. Zola", 30 September 1902". The Guardian. 29 June 2002. ^ "Full text of "Emile Zola Novelist And Reformer An Account Of His Life And Work"". Archive.org. Retrieved 7 February 2014. ^ "Paris Monuments Panthéon-Close up picture of the interior of the crypt of Victor Hugo (left) Alexandre Dumas (middle) Emile Zola (right)". ParisPhotoGallery. Retrieved 30 January 2012. ^ a b Mounier-Kuhn, Angélique (8 August 2014). "L'asphyxie d'Émile Zola". Le Temps (in French). pp. 8–9. ^ Cummins, Anthony (5 December 2015). "How Émile Zola made novels out of gutter voices and ultra-violence". The Daily Telegraph. London. Retrieved 3 November 2016. ^ "Rougon-Macquart cycle: Work by Zola". Encyclopædia Britannica Online. Encyclopædia Britannica, Inc. Retrieved 3 November 2016. ^ György Lukács, Studies in European Realism. A Sociological Survey of the Writings of Balzac, Stendhal, Zola, Tolstoy, Gorki and Others, London: 1950, pp. 91–95. ^ Émile Zola, Les Romanciers naturalistes, Paris: 1903, pp. 126–129. ^ Letter from Émile Zola to Jules Lemaître, 14 March 1885. ^ See Émile Zola's speech at the annual banquet of the Students' Association at the Hotel Moderne in Paris, 20 May 1893, published in English by the New York Times on 11 June 1893 at http://www.positivists.org. ^ Émile Zola, Les Œuvres complètes, vol. 34, Paris: 1928, Thérèse Raquin, preface to 2nd edition, p. viii. ^ Émile Zola, Les Œuvres complètes, vol. 34, Paris: 1928, Thérèse Raquin, preface to 2nd edition, p. xiv. ^ Émile Zola, Les Œuvres complètes, vol. 22, Paris: 1928, Le Docteur Pascal, p. 38. ^ Holden, Stephen (29 March 2017). "Review: In 'Cézanne et Moi,' Zola and the Artist Are Pals. However ..." The New York Times. p. C8. Borie, Jean (1971). Zola et les mythes: ou, de la nausée au salut. Pierres vives (in French). Paris: Éditions du Seuil. OCLC 299742040. Brown, Frederick (1995). Zola: A Life. New York City: Farrar, Straus and Giroux. ISBN 978-0-374-29742-8. OCLC 31044880. Ellis, Havelock (1898). "Zola". Affirmations. London: Walter Scott. pp. 131–157. Hemmings, F.W.J. (1966). 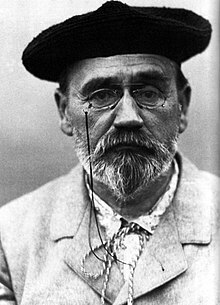 Émile Zola. Oxford: Clarendon Press. OCLC 3383139. Lukács, György (1950). Studies in European Realism: A Sociological Survey of the Writings of Balzac, Stendhal, Zola, Tolstoy, Gorki and Others. Translated by Edith Bonee; foreword by Roy Pascal. London: Hillway Publishing. OCLC 2463154. Mitterand, Henri (1986). Zola et le naturalisme [Zola and Naturalism]. Que sais-je? (in French). Paris: Presses Universitaires de France. ISBN 978-2-13-039642-0. OCLC 15289843. Mitterand, Henri (1999). Zola (in French). Paris: Fayard. ISBN 978-2-213-60083-3. OCLC 659987814. Newton, Joy (1967). "Émile Zola: impressionniste". Cahiers naturalistes (in French). 33. pp. 39–52. Newton, Joy (1967). Cahiers naturalistes (in French). 34. pp. 124–38. Wilson, Angus (1952). Émile Zola: An Introductory Study of His Novels. London: Secker and Warburg. OCLC 818448. Woehr, Jack J. (2004). "The Rougon-Macquart Novels of Emile Zola (for English-speaking Readers)". Retrieved 28 January 2011.